Oceanic Cooling Towers Private Limited, established in the customer focusedyear 1992, engaged in manufacturing and exporting of Draft Cooling Tower, Designed Cooling Tower, FRP Cooling Towers, etc. Our range of cooling towers is high in quality and superior in performance. Our promoters have been working in the cooling tower industry since last several years and they have in-depth knowledge of thermal engineering and its applications. We understand the various requirements of this industry and thus better equipped to face the competition. The compacustomer-focusedapproach and every care is taken to ensure maximum customer satisfaction. Under the guidance of Mr. Sandeep Pal Mandal (CEO), we have created a niche in this industry by offering our clients with an exclusive range of FRP cooling towers, fiber reinforced plastic cooling towers, wooden cooling towers and their spare parts. "Cooling Tower man of the year" by Governor of Haryana at Ashoka Hotel, Delhi." Quality is the central force, which is responsible for our progressive growth in this competition-oriented world. We give utmost importance to the quality of our products and services, as these are prime reasons of our success so far. We have a quality control department, which is responsible to check quality of our various water solution products. The raw material we use is procured only from reliable and established vendors and the quality is rigorously checked at different stages of production and supply using latest testing equipment. 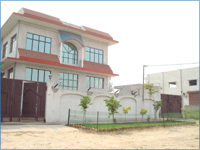 The company is situated in the national capital of India - New Delhi, with excellent infrastructural facilities. Our manufacturing unit at Greater Noida is equipped with all the latest machines and technology to produce high quality and superior performance water cooling tower systems, cooling towers, water treatment plants and spares. Another major asset to our production facilities is our team of experienced and qualified people, who are dedicated to offer best products to our customers. Besides qualified sales staff and planning/design engineers, we have a permanent work force of site supervisors , erectors, and fitters with long standing experience in the installation of various kinds of cooling towers, all across the country. The Company has developed documented quality management systems within the organization in line with ISO 9001:2000 to achieve high efficiency amongst its team members. The scope of this manual is to specify the requirements for this quality management system where our organization will demonstrate its ability to provide product that meets customers and applicable statutory and regulatory requirements; and to enhance customer satisfaction through the effective application of the system. 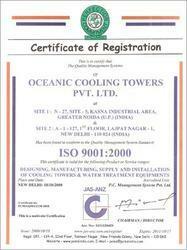 Oceanic Cooling Towers, takes pride in its excellent track record of timely execution of its all orders. The company is committed to maintain this record and has setup a flexible production capacity and a reliable distribution to fulfill bulk and immediate requirements of clients. We, at Oceanic Cooling Towers work with a customer focused approach and every care is taken to give them a pleasant experience, every time they deal with us. We give prime importance to trust, mutual benefit and transparency in our relationship with clients and believe in building long lasting partnerships. We always welcome any feedback or queries from our clients in order to serve them better. Punjab Concast Ltd. Nahar International Ltd. Monnet Industries Ltd.
Dewan Rubber Industries Ltd. Frontier Alloys Steels Ltd Raipur Ferro Alloys Ltd.
Rajasthan Synthetics Industries Ltd. Unitech Machine Ltd. Akash Ispat Ltd.
Allied Strips Ltd. Ball & Cylpebs Ltd. Clutch Auto Ltd.
Sikka Paper Mills Pvt. Ltd. Triveni Engineering & Indus Ltd. Karam Chand Thapar & Bros. Ltd.
Kamper Concast Ltd. BHEL Oswal Oil & Fats Ltd.
Department of Telecommunication Oswals Asian Alloys Ltd.
Nahar Group of Company B.P Oils Mills Ltd. Renolds India Pvt. Ltd.
Kajaria Ceramics Ltd. CITCO Ltd Yamuna Alloys Ltd.